HOME > REVENUE AREA > How can I Open/Stop Sales of Promotions? Promotion revenue includes the possibility to chose if the hotel wants to open/ stop promotions individually or according to room open/ stop sales. 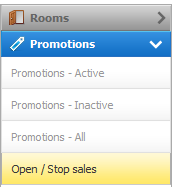 Opening or stopping sales on a room will not affect that room's derived promotions. You must Open/Stop sales on the promotion independently. You will not be able to Open/Stop sales on the promotion independently. Opening or stopping sales on a room will always open or stop sales on all derived promotions. How can I set independent open/ stop sales between Rooms and Promotions? and select the option OPEN/STOP SALES. STEP 2: Above the calendar area, select the promotion you wish to update from the drop down list. STEP 3: Select the relevant dates, by clicking on the calendar or drag the mouse to select a wider period. STEP 4: Next to the drop down list, you now need to click on OPEN SALES or STOP SALES. STEP 5: Click on REVIEW AND PUBLISH CHANGES, to confirm the changes. STEP 6: On the summary screen review the changes and confirm them by clicking on PUBLISH IT.